Slow and Steady Wins the Race. Are you Sprinting Towards the Finish Line? I wish I kept a tally of the total times people have asked me for quick weight loss tips. Sure, there are quick tips and tricks, but at what cost? Quick & unsafe weight loss only to regain and add more weight? Choosing to play the long-term game when it comes to becoming healthier, instead of trying to find the shortcuts, will save a lot of headaches. Small, baby steps make a big impacts long term. People who don’t play the long game don’t succeed. 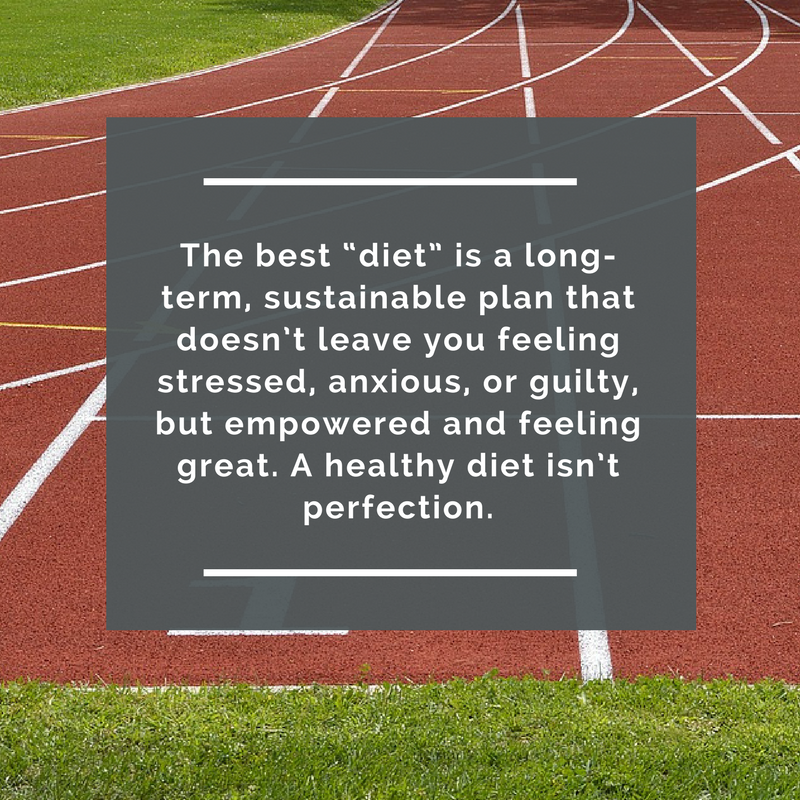 The best “diet” is a long-term, sustainable plan that doesn’t leave you feeling stressed, anxious, or guilty, but empowered and feeling great. A healthy diet isn’t perfection. Perfectionism often leads to disordered eating habits and an unhealthy relationship with food. Let’s use Sue as an example; Sue has a morning where everything goes perfect. She even packed lunch and snacks the night before. She’s feeling pretty great and confident! But Sue gets a little stressed at work due to a deadline moving up and at the same time, someone brought in a box of donuts. Sue loves donuts, but she previously told herself not to eat any because it would ruin her diet. Then, because of her stress, the smell, and maybe a coworker encouraging her to have one, she eats one! Sue then thought, “Screw it! Might as well start again tomorrow!” as she continued to eat more donuts and some candy on another coworkers desk. Then once off work, she goes to the drive-thru to get an unhealthy dinner even though she had already prepared food at home. To Sue, there was no point in eating her already-prepared healthy food because she “blew” her diet with that one donut. Sue has a black and white mentality when it comes to food. All or nothing. 100% or 0%. What if I told you that Sue could reach her goals with 90% instead of 100%? Or 80%? Or even 60%? Having a “slip up” of eating that donut would not have an impact on Sue’s long-term goals. But throwing the whole day away any time a “mistake” is made? All or nothing is NOT consistency, and that will not lead to her long-term goals. Consistency is so much more important and it is the opposite of a perfectionistic mindset. The above example is not the only example of what an unhealthy relationship with food can look like, but it’s a common one. And it’s very common in chronic dieters who are NOT focused on the long-term game of sustainable changes and a healthy relationship with food. Chronic dieters are more likely to fall for short-term fad diets and are more likely to eat for emotional responses or simply because food is available. For many, dieting can be a predictor of future weight gain. Strict dieting can produce stress hormones, making it even harder to lose weight and easier to gain it in unwanted areas. The unwillingness to slow down and make real changes leads to failing long-term. Even if Sue was able to have a successful diet, she will not be able to keep it off long-term without addressing her damaged relationship with food. A long-term, healthy focus will provide less stress to the body, a reduced risk of binge eating – a common mammalian response to severe caloric deprivation (starvation) – and it will give yourself a chance to build muscle (which utilizes more energy) to reduce the natural decrease in metabolism from losing weight. It can also let you establish a new set-point weight in which your body is comfortable at. Many times people will regain weight lost because when the weight was lost, their body was in a state of stress and wanted more than anything to go back to its “normal”…which was the previous weight (and often even more). All of these examples take time. These indicators of a healthy relationship are not an overnight change, and for some it can take years of working on. You can’t expect decades of disordered eating habits to be fixed in a short time. But what you can do is dive deeper into what your race mentality looks like. Are you in super speed mode? Or are you taking it slow and steady? Spend some time thinking about it and ask yourself if you would want your relationship duplicated in your daughter, son, spouse, parent, friend, etc. If you wouldn’t want them to experience the same as what you are currently doing, it’s likely an indicator of an unhealthy relationship with food that needs to be addressed. Slow, steady, and consistent wins the race. Small steps make a big impacts over a year or more.